New hope for Dubai investors on stalled projects? Dubai: Back in 2006, when the ‘market was at its peak’, Indian Salim Shaikh bought two properties amounting close to Dh500,000. Six years later, neither of his project has seen the light of day and a significant chunk of money remains stuck. Yet Shaikh hasn’t given up hope. He, like several other forlorn investors, now believes a new decree by the Ruler of Dubai will bring deliverance. “I read about a new panel being set up to settle disputes related to projects cancelled by the Rera (Real Estate Regulatory Authority). It’s encouraging,” Shaikh says. Recently it has emerged that Dubai will liquidate scores of cancelled projects and use the funds to repay investors. Shaikh paid Dh186,610 for a one-bedroom unit in the Toronto Tower project in International City Phase III. The price of the development was Dh327,386. It was due for completion in November 2007. Six years on all that stands on a large swathe of barren land is a long stretch of rickety black fence. “When I sought to withdraw from the project they offered me only 30 per cent as refund and said that I could challenge them if I liked. Lawyers told me it was a straight case and I would win it but then what? I had no confidence of getting back the actual amount,” said the 52-year-old, who had shelled out another Dh257,000 for a one-bedroom unit at Chapal the Harmony project in Emirates City, Ajman. Only five levels out of a planned 27 and six parking levels were complete as of last month. On paper it should have all been completed by 2011. Shaikh says the developers have offered him a ‘swap deal’ with a Dubai Sports City property but at a ‘premium price’, Dh100,000 above the market rate. The International City project is apparently up for liquidation. “I came to know about it from another investor. When I contacted Rera, they confirmed that the project was up for liquidation but didn’t specify other details. In response to an XPRESS query about the refund process, the Dubai Land Department said that investors could contact Dubai Courts as the committee in question belongs to them. Canadian expatriate Taimur, 27, invested about Dh850,000 in four one-bedroom units worth Dh2 million in a Dubai Lagoon project undertaken by Schon Properties. Due for completion in 2007 it has yet to be finished. But he too, like Shaikh, hopes he will not be forced to forget about his hard-earned money. 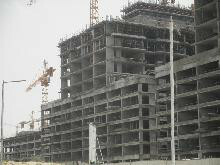 About 217 projects were cancelled in Dubai between 2009 and 2011, according to Rera.